Striking the right tone for a family-friendly horror movie is tricky. You want it to be scary enough to freak out the big kids, but not so scary that the little ones cry and have nightmares for months. Steven Spielberg and his Amblin Entertainment banner arguably perfected the formula back in the ’80s with films like E.T. 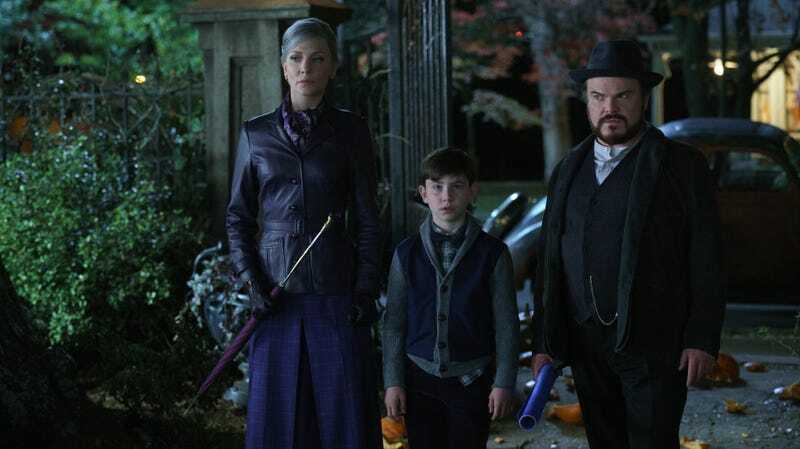 The Extra-Terrestrial and Gremlins, and now the newly reinvigorated Amblin presents an ooky-spooky, creepy-crawly Halloween treat for horror-fans-in-training with The House With A Clock In Its Walls. The unlikely vessel for this warm, whimsical PG-rated fantasy-horror movie is director Eli Roth, best known for mean-spirited gore flicks like Hostel and The Green Inferno. Roth, who grew up on this stuff, nails the look and tone of Spielberg, Joe Dante et al in the film, based on John Bellairs’ 1973 kids’ mystery novel of the same name. That book was illustrated by the American master of all things morbid and Victorian, Edward Gorey, and although Roth blends Gorey’s gothic sensibilities with the small-town mid-century Americana of his cinematic forebears, Gorey’s mischievous, dark sense of humor translates to the screen intact. The result is a high-end version of one of those direct-to-video kids’ movies that play on the Disney Channel all throughout October, all cobwebbed tombstones behind iron cemetery gates and dead leaves crunching underfoot. Owen Vaccaro, a child actor probably best known for his appearances in the Daddy’s Home movies, stars as introverted outcast Lewis Barnavelt, a 10-year-old orphan (they’re always orphans in these types of stories) who, at the beginning of the film, has boarded a bus to go live with his uncle Jonathan (Jack Black) in a small town in Michigan. Sounds prosaic enough. But upon his arrival, Lewis discovers that his uncle’s place is no threadbare bachelor pad. It’s a creaky old Victorian mansion, full of overstuffed chairs, flocked wallpaper, stained glass, creepy carnival curios, and dozens and dozens of clocks. And his uncle is no normal bachelor. He’s a warlock—albeit a mediocre one. His next-door neighbor and platonic lifemate, poised, purple-clad witch Mrs. Zimmerman (Cate Blanchett), is much more powerful. Together, the duo takes young Lewis under their wings and teaches him the ways of magic as the house comes alive all around them. The cheerfully cluttered production design, enhanced with playful effects that bring to life the house’s many magical residents—a topiary griffin, a doglike armchair, an ever-shifting stained-glass window—is the true star of the film’s first half. Part toy box and part cabinet of curiosities for a young misfit finally finding his tribe, the house has competition only from Black, who always excels in roles that let him play an excitable kid in a grown man’s body, and does so here as the bumbling, sorcerous Uncle Jonathan, forever knocking things over with beams of energy and waking up the neighbors with free-jazz saxophone at 3 a.m. The film stumbles as its plot gets more complicated, introducing the house’s previous resident, evil warlock Isaac Izard (Kyle MacLachlan), Jonathan’s former partner-in-magic who turned to the dark side after an encounter with a demon named Azazel (Christian Calloway) during World War II. 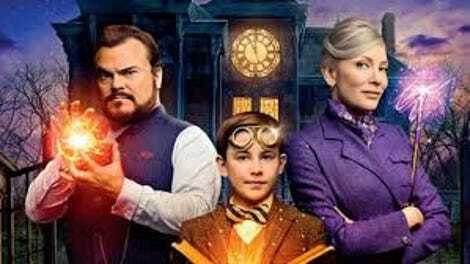 (Much like the ’80s films that inspired it, The House With A Clock In Its Walls has a touch-and-go relationship with adult themes, implying but not quite revealing a world full of tragedy and prejudice just outside of the magical bubble in which our characters live.) Jonathan came to inhabit the house after Izard was killed in the execution of a particularly diabolical spell, and spends his nights searching for the source of a mysterious ticking in the walls that he suspects is counting down to a full-on apocalypse. Then Lewis unwittingly brings Izard back from the dead trying to impress a schoolmate with his spellcasting abilities, and all magical Hell breaks loose. The fantasy and horror sections of The House With A Clock In Its Walls, including a scene where our core trio must fight reanimated jack-o’-lanterns, are full of wonder. Some of them—and this is a sentence we never thought we’d write about an Eli Roth movie—downright sparkle. But the screenplay, from Supernatural creator Eric Kripke, diverts too often to inert scenes of Lewis’ struggles at school, and a subplot about his on-again, off-again friendship with bully Tarby Corrigan (Sunny Suljic) feels like a distraction from the magical business at hand. A decision to bury MacLachlan under heavy prosthetics and put a metallic filter on his voice similarly robs much of his too-short screen time of its magic, rendering the film’s two main conflicts the least interesting parts of the story. (MacLachlan does appear normally in silent movie-style flashbacks, and the director makes one of his famous cameos as a character in Lewis’ favorite serial, Captain Midnight.) It’s almost as if Roth can’t wait to get back to playing with pumpkins and magic wands—which, in its way, proves his spooky-kid credentials more than anything else in the film.